Teaching thousands of anatomy and physiology students over the decades has taught me that a major hurdle is being able to see the "big picture" of the structure and function of the human body. 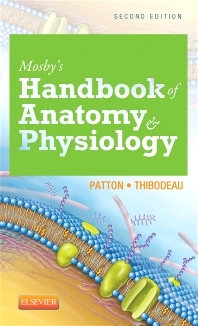 Because the A&P course necessarily includes a nearly overwhelming collection of detailed, technical facts expressed in a language that is foreign to many beginning students, they become so focused on each bit of information that they have hard time putting it all together into a coherent conceptual framework. One approach would be to present a concept map—or some type of graphic representation—of all the core concepts of each body system. 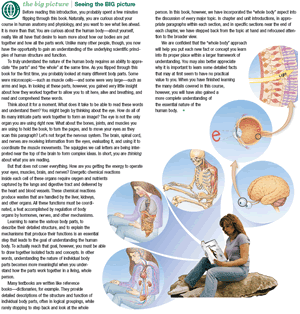 For example, a graphic showing how the system explored in a particular chapter ties into the structure and function of all the other systems of the body. I think a graphic approach can be very useful, but I wonder if that strategy isn't better used as an active learning exercise in which each learner creates their own concept map—perhaps after some of the initial learning of a topic has already taken place. Or, even better, make it a collaborative study project among a group of peers. I think a better approach in a textbook with limited page space is to build a "big picture" perspective into the narrative of the story. 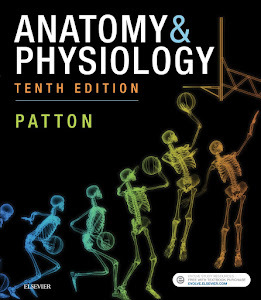 So that's why in Anatomy & Physiology we have included a highlighted section at the end of each chapter that briefly pulls the reader back from the details of the chapter and widens the focus to take in a bigger, more global perspective. It calls the reader's attention to a whole-body, integrated view of the current topic's place in the wider scheme of human structure and function. It gives specific examples of how the current topic relates to—or builds upon—concepts covered in previous chapters. This encourages students to integrate new concept with their growing framework of of knowledge to construct a solid understanding of A&P. This feature also looks ahead to concepts of later chapters by mentioning how the current topic will lead to a fuller understanding of concepts yet to be explored in the A&P course. It improves reading comprehension of each chapter by calling attention to the main themes and reminding the reader of core concepts within a meaningful context. The Big Picture specifically relates the current topic such core principles as homeostasis and form-fits-function. 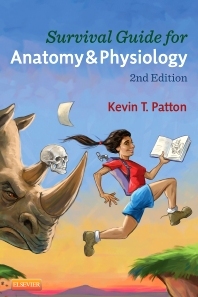 Besides outlining specific examples of connections among concepts, The Big Picture also asks students to think about the integration of concepts themselves—thus encouraging them to develop the critical thinking skills needed to take their A&P learning forward into later courses (and into their professions). To get the reader's attention, a one-page introduction called Seeing The Big Picture faces the first page of Chapter 1 of Anatomy & Physiology. This feature grabs the readers attention immediately and sets them along their path already looking for the big picture. It encourages students to think about relationships as they read—but also tells them to look for The Big Picture at the end of each chapter to help them "get" the big ideas of the chapter. We have given a lot of thought to which strategy works best to help readers understand whole-body relationships. We are certain that the tried-and-tested summary narrative The Big Picture works well in stimulating critical thinking and construction of a solid conceptual framework than a pre-constructed chart that may short-circuit the learning process in a learner's mind. Preparing is an unchanging strategy for managing things since we all in all know their essentials and their consequences for the individual's standpoint since we know an individual has its own http://www.gifellowship.com/ over the overall population and their quality issues. That is the mental ability and the professional approach of a student where he can see the big picture and can take help from http://www.endocrinologyfellowship.com/tips-for-reproductive-endocrinology-and-infertility-fellowship-personal-statement/ to maintain what is the requirement of the time. When you have an influencing guider to see here at you so you can see all the things from a different perspective and this can he helpful for all of us as well. This is the teacher o the students who helps them to look at the bigger picture of what is in front of them and they click to read what is requirement of the tasks. You can see the big picture of the helping students and can draw the new structure of the life from this best package. You can visit this site and can enjoy the best structure of the anatomy with this special zone. 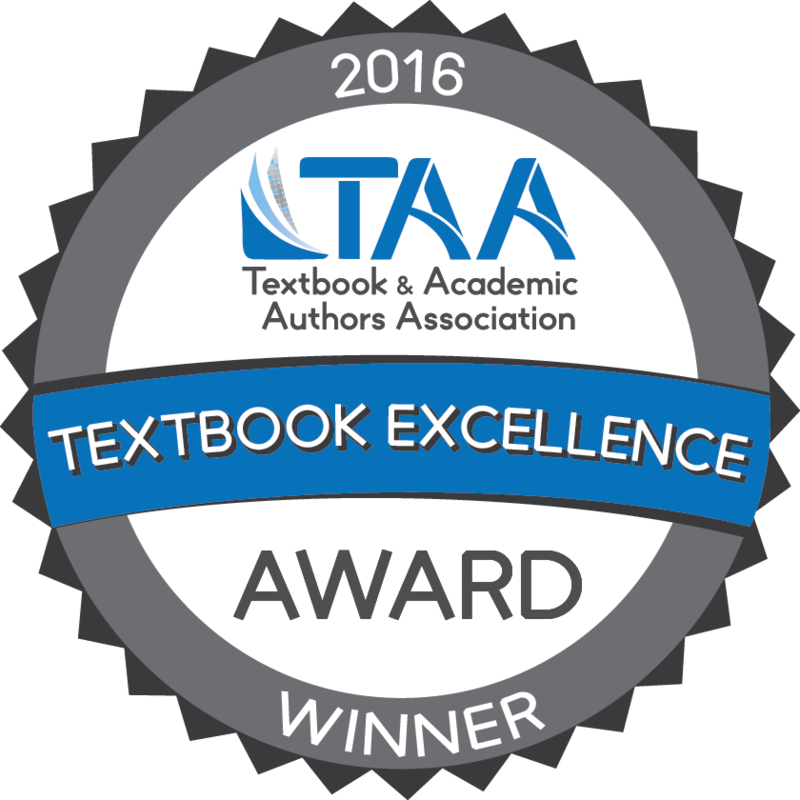 Textbook and textbook samples copyright Elsevier Publishing, which is not responsible for the content of this blog.